The Africa of around 2.3 million years ago was one of the most diverse habitats on the planet. Species both familiar and unfamiliar roamed the plains, such as dinofelis, the false sabre tooth cat; the giant elephant-like deinotherium; the herbivorous ancylotherium... and multiple species of two-legged ape men. In East Africa (Ethiopia, Tanzania, and Kenya), a hominid called Paranthropus boisei appeared, surviving until 1.2 million years ago. This vegetarian hominid was descended from Paranthropus aethiopicus and had a big, flat face with a massive jaw. It lived at a time in which the once-great forests had almost vanished from East Africa, creating a shortage of food such as soft fruit. Boisei males reached a size of about 137cm in height and 49kg in weight, and the size difference to females suggests that they may have lived in groups which were organised in harems, in which one male mated with many females. Modern gorillas have a very similar social set-up. Males were easy to spot amongst a harem of females; they were much more muscular with much bigger faces. Bosei became fairly specialised in its diet. Its enormous jaw, massive chewing muscles and huge molars - the biggest and flattest of any known hominid - long led experts to believe that its diet consisted principally of tough-to-chew but more abundant plant foods such as nuts, roots, and tubers (an underground vegetable, a bit like a potato). More recent research suggests a strong likelihood that it was eating soft fruit and grasses, competing directly with ancestral zebra, hippos, warthogs, and pigs. By becoming a highly specialised vegetarian, Paranthropus boisei ensured a comfortable life for itself. 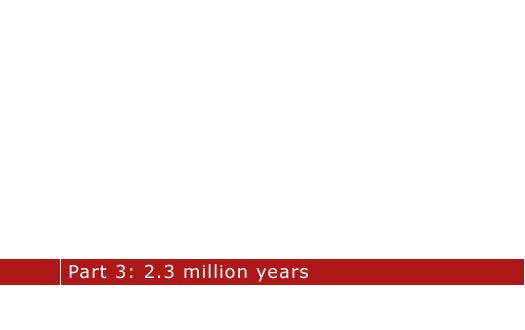 Only by 1.2 million years ago would this specialisation backfire. Food was not as easily available for Homo habilis ('handy man') as it was for Paranthropus boisei at this time. This new hominid lived alongside boisei in East Africa. 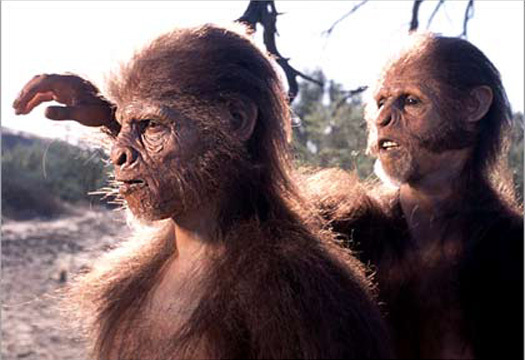 It was descended from Australopithecus garhi and, alongside Homo rudolfensis, it was the joint earliest of the Homo species. With their apelike long arms and short legs, this ape man could not eat the same tough plant foods which boisei ate because its jaw and teeth were too small. Homo habilis had small teeth and ate anything it could lay its hands on, especially meat. But impish habilis was no hunter. Attracted by circling vultures, it probably scavenged the leftovers from a big kill such as an antelope left in a tree by a leopard, or a large animal such as a wildebeest which had been slaughtered by lions. Because meat is rich in calories and nutrients - easy-to-digest food - early Homo lost the need for the big intestines that apes and earlier hominids had. This freed up energy for use by other organs. This surplus of energy seems to have been diverted to one organ in particular: the brain. But scavenging meat from under the noses of big cats is a risky business, so good scavengers need to be smart. At this stage in hominid evolution, a big brain was associated with greater intellect. Big brains require lots of energy to operate: the human brain uses twenty percent of the body's total energy production. The massive calorific hit which would be provided by meat helped to kick-start an increase in the brain size of early humans. 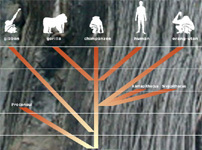 Although the details of many homininds are argued over by anthropologists, Homo habilis and its classification is particularly controversial. Many of the habilis fossils which have been found have been categorised differently by different anthropologists. One important specimen is OH 7. Found at Olduvai Gorge in Tanzania, the hand bones resemble later species of the genus Homo, rather than the australopithcines. In another fossil, OH 24, the skull bones are thin and the brain case is larger than hominid predecessors. It also has a short, straight face with teeth which show that it was an omnivorous species. Telltale cut marks on the surface of animal bones reveal that early humans were using crude stone tools to smash open bones and extract the bone marrow within. Stone tools allowed early Homo habilis to get at this food source that no other creature was able to obtain. Bone marrow contains long chain fatty acids that are vital for brain growth and development. This helped further fuel the increase in brain size, allowing our ancestors to make more complex tools. The tools made by habilis are called 'Oldowan tools'. The process used to make these tools was incredibly simple. Hominids picked up one stone, known as a core, and broke it with another, known as a hammerstone or percussor. This gave them a sharp cutting edge which could pass through an animal's hide. By remaining adaptable, early Homo ensured that when the world changed, they had changed with it - whether it was habilis or rudolfensis which was the direct ancestor of modern humans. By two million years ago, a new species of Homo was evolving in East Africa - Homo ergaster. For a time it existed alongside populations of habilis and rudolfensis, but this new species had something which they did not, a skill which would expand its horizons beyond the confines of its homeland and out of Africa. However, there may have been a missing link between habilis or rudolfensis and Homo ergaster - the more recently-discovered Australopithecus sediba. The remains of two human-like fossils found in South Africa in 2010 were not fully understood until they were examined in greater detail in 2011. Then it was discovered that they could be a pivotal link between later Homo species and earlier Australopithecus species. Named Australopithecus sediba, features seen in the brain, feet, hands and pelvis all suggested that this species was on the direct evolutionary line to modern humans. These are all critical areas of anatomy and to have all these features fit into the human evolutionary path rather than just one or two makes sediba a near-certain ancestor. While the previous link in the chain is not known for sure - it may be either Homo habilis or Homo rudolfensis (the former was long the favourite, but rudolfensis is staging a come-back) - sediba is a more credible ancestor for Homo ergaster via that link. 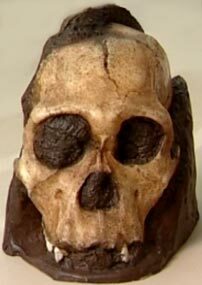 The sediba specimens were unearthed at Malapa in the famous 'Cradle of Humankind World Heritage Site', just to the north-west of Johannesburg. They were pulled from a pit - a depression left in the ground by a cave complex which had lost its roof through erosion over time. Identified as an adult female and a juvenile male, the two individuals were quite possibly mother and son. What seems certain is that they died together in some tragic accident which saw them either fall into the cave complex or become stuck in it. After death, their bodies were washed into a pool and in time they were cemented along with the remains of many other animals which were trapped in the same way. The latest dating technologies were applied to the sediments encasing the fossils, and these narrowed any window of uncertainty to little more than 3,000 years. The age of the fossils is between 1.977 and 1.98 million years, placing its appearance just before that of ergaster. Smithsonian: What does it mean to be human? While it is generally thought that either habilis or rudolfensis are direct ancestors of modern man, it could be the case that neither are - they could instead be cousins while sediba emerged alongside them to be our true ancestor. The pelvis on the female is short and broad like a human pelvis. A more ancient creature like the famous Lucy specimen has a flatter and more flaring pelvis. A popular idea has been that the modern human pelvis evolved in tandem with the gradual growth in brain volume, facilitating the birth of babies with bigger heads, but sediba gives the lie to this theory, because it had a modern-looking pelvis while possessing a small brain. The result of this new information seems to be that several australopithecine forms all existed and evolved side-by-side as they turned to meat-eating and tool-making and moving greater distances. Just one of these forms is the direct ancestor of modern humans, but working out which one requires more finds like this. A word of warning emerged in New Scientist in 2014 when other experts were able to see the results of the discovery. The two individuals may instead be four, with the bones mixed together. Another option is that sediba is not really a species in its own right but a stage in the relatively brief transition between two others. The jury is still out. 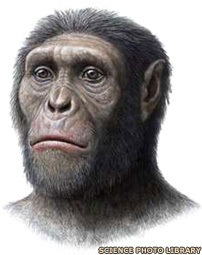 An artist's depiction of how sediba may have looked - but was it really a species?